Though most Americans are not ready to cut and run, an increasing number are having second thoughts about U.S. involvement in Afghanistan. Pew Research Center’s November poll finds the number saying the initial decision to use force in that country was the right one has fallen to 56%, 8 percentage points below the level recorded in January. By the same token, a late September Pew Research poll found that support among Americans for keeping U.S. and NATO troops in Afghanistan until the country is stable stood at 50% — a hefty seven point drop since June. This despite the fact that fully three-in-four Americans see a Taliban takeover in Afghanistan as a major threat to the well-being of the United States. Yet even as enthusiasm for American involvement in Afghanistan has faded, the public has assumed a warlike stance on another front: Iran. In an October Pew Research survey, a substantial 61%-majority of Americans say that it is more important to prevent Iran from developing nuclear weapons, even if it means taking military action. Far fewer (24%) say it is more important to avoid a military conflict with Iran, if it means that the country may acquire nuclear capability. While only among Republicans is there substantial support for keeping troops in Afghanistan (71% favor staying until the situation there stabilizes), support for possibly initiating military action against Iran extends more broadly across the political spectrum. An identical 71% of Republicans are primed for armed conflict to prevent Iran from going nuclear, but in this case they are joined by 66% of independents and a 51%-majority of Democrats. And among Democrats, fewer than a third (31%) oppose military action should Iran acquire nuclear weapons. True, a recent ABC News poll, in which questions asked about support for specific types of military action, found that while 87% of the public thinks Iran is trying to develop nuclear arms, only 42% support U.S. air strikes against its nuclear development sites, while 33% favor a U.S. invasion of Iran. ABC’s questions, however, did not present a stark choice between Iran’s acquisition of nuclear capability and preventive U.S. military action as did the Pew Research question. In fact, the Pew Research survey also found broad support for diplomatic measures — most Americans just don’t think they’ll work. Fully 63% of the public approves of direct negotiations with Iran over its nuclear program, but only 22% expect that such talks will succeed. Still more (78%) favor the imposition of tougher economic sanctions on Iran but, again, relatively few (32%) see such sanctions producing a reversal in Iran’s apparent efforts to acquire nuclear weapons capability. And when faced with the choice between a nuclear-armed Iran and military action, most Americans chose conflict. The U.S. public’s apparent willingness to commence hostilities against Iran, while making for the exit in Afghanistan, may seem puzzling. Nuclear weapons, of course, understandably evoke public fear. But other, more proximate U.S. foes, notably North Korea, have proven nuclear weapons capability, not just the threat of developing it. Moreover, Iran has never launched an attack on the U.S., while the perpetrators of the only massive attack on the American continent in nearly two centuries were harbored in Afghanistan. Of course, other factors — such as Iran’s vast oil reserves,and its strategic location both in terms of its relative proximity to Israel and ability to cut off access to the Persian Gulf — may account for this heightened sensitivity to a perceived Iranian threat. Still, it is interesting to note that the contrast between attitudes toward military involvement in Afghanistan and Iran fits into a temporal pattern seen in the attitudes of Americans toward other U.S. military deployments in past decades. Americans generally like their wars to be successful or short — and ideally both. That was not the case, however, when Americans first entered the fighting. In August 1965, asked by Gallup whether “in view of the developments since we entered the fighting in Vietnam” was the decision to send troops a mistake, fully 60% said no, while only 24% said yes. As late as January 1967, the public still weighed in on the side of no mistake (32% yes, 52% no). A year later, as U.S. casualties mounted, the public was beginning to have serious second thoughts with 46% calling our involvement a mistake, although a nearly equal 42% still didn’t think so. By January 1969, views had further soured with the public calling the war a mistake by a 52%-to-39% margin. In the following years that margin increased, mounting to 60% “yes” versus 29% “no” in January 1973. That negative assessment not only persisted but increased in the years long after the war concluded: In April 1995, Gallup found 71% labeling U.S. involvement in the Vietnam conflict a mistake, while only 23% approved of it. Attitudes toward the still ongoing conflict in Iraq have followed a similar trajectory over its more than six-year duration. In January 2002, a few months after the attacks on the World Trade Center and the Pentagon on Sept. 11, 2001, a Pew Research Center poll found the public was ready for war against a variety of countries with no known direct connection to the attacks — including Somalia as well as Iraq (see chart on the right from that survey). Declining proportions took that upbeat view in subsequent surveys. 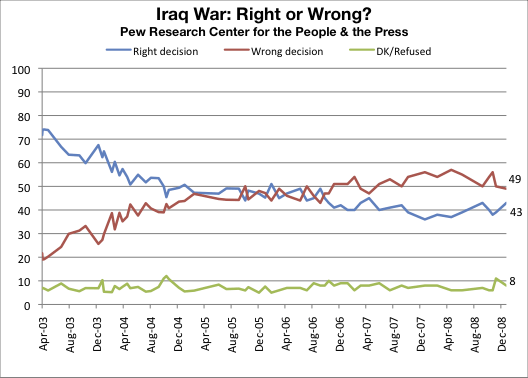 Starting in February 2005 (with the one exception of a jump to 51% in February 2006), fewer than half of Americans judged the Iraq war to have been the right decision. By the time of the November 2008 presidential election, the decision-split registered at 39% right versus 50% wrong. As the public’s view of the progress of the military effort improved, the number judging the decision to have been correct rose marginally to 43% by the time of Barack Obama’s inauguration in January 2009 (as shown in the chart on the right). By contrast, a hefty 64% approved of the decision to use force in Afghanistan, the subject of relatively little media coverage or official pronouncements compared with the conflict in Iraq. Not all U.S. military engagements in Iraq have followed this trajectory. The father of the more recent President Bush, George H.W. Bush, was far more successful in winning hearts and minds in his invasion of that country in 1991. When the possibility of U.S. intervention was first raised, following Saddam Hussein’s invasion of Kuwait in August 1990, Americans were initially somewhat ambivalent. By November, the public was clearly armed for battle with 79% telling a Gallup poll that they supported the use of military force to drive Iraq out of Kuwait and ABC and other polls registering similarly high levels of support. And while a Gallup/Newsweek poll in early January 1991 found 48% of Americans thinking that the president should wait longer than the January 15th UN deadline to see if sanctions would persuade Saddam to withdraw from Kuwait, once the invasion was launched, fully 75% told an NBC/Wall Street Journal poll that Bush had waited long enough. In an analysis of the interplay between public opinion surveys and public policymaking, Pew Research Center President Andrew Kohut credits George H. W. Bush with a masterful rallying of public support for the war. Especially crucial, he notes, were the president’s seeking and securing of a U.N. deadline for withdrawal and his likewise successful seeking of congressional support. Of course, had the fighting in the Persian Gulf not been brief, and the objective well-defined and achievable, public support might well have been short-lived — as were the very high approval ratings that President Bush enjoyed immediately after the successful conclusion of hostilities. Nor did the fast victory eradicate America’s post-Vietnam aversion to armed conflict. Gulf War glow was fast fading, hastened by the downturn in the economy and the short but bloody outcome of U.S. intervention in Somalia. In December 1992, when President Bush sent marines into Somalia to help a U.N. effort to relieve the massive starvation and bloodshed produced by rival warlords and their factions, the U.S, public was strongly approving. About three-in-four (74%) told a Gallup poll that month that they approved of the decision, although only a bare majority (52%) was even somewhat confident that American troops would be able to withdraw within a few months as then planned. By September 1993, public enthusiasm for the intervention had dimmed somewhat, with the public evenly divided in a Times Mirror poll on the question of then-President Bill Cinton’s handling of the Somalia situation (41% approve, 39% disapprove). And when, on Oct. 3-4, two Black Hawk helicopters were downed and 18 U.S. troops killed and 73 wounded in the ensuing bloodshed, Americans turned sharply against U.S. involvement in Somalia with only 33% expressing approval of Clinton’s handling of the situation in Somalia in a late October poll. The Somalia experience likely contributed to the U.S. public’s reluctance to become involved in efforts against Serbian attacks on the former Yugolavian Republic of Bosnia. But Americans were already wary about involvement in Balkan wars before the downing of the Blackhawks in October 1993. When Gallup began testing public sentiment on this question in the spring of that year, a solid 63% of Americans opposed any U.S. military involvement, even air strikes. In January 1994, in a Gallup/CNN/USA Today poll, fully 68% said the U.S. should keep out of the conflict. However, by April of that same year, following President Clinton’s decision to conduct U.S. air strikes against Serbian positions, two in three among the public (65%) approved of U.S. bombing. By September 1995, as reports of massive Serbian atrocities mounted, a hefty 67% favored sending U.S. troops to Bosnia as part of an international peacekeeping force if they were sure no American soldiers would be killed. But when, in that same poll, the eventuality that even 25 U.S. soldiers would be killed was posed, support plummeted to 31% in favor vs. 64% opposed. While the portion of the public saying that the U.S. had a moral obligation to help keep the peace in Bosnia registered at 53% by November 1995, only 36% felt that the U.S. needed to be involved to protect its own interests. And a month later in December 1995, following the initial signing of a peace agreement on December 14, only 33% of the public agreed that Clinton had made the right decision in deploying U.S. troops in Bosnia, although an additional 27% said they would support the decision anyway in recognition of Clinton’s role as commander-in-chief. Gallup surveys recorded majorities ranging between 53% and 58% registering disapproval of the presence of U.S. troops in Bosnia through mid-1997. But by December of that year, the balance shifted to 49% approve/43% disapprove. And by the following month, January 1998, a clear 53%-majority registered approval as compared with 43% disapproving. Had U.S. troops become involved in active fighting in Bosnia, however, public opinion might well have traced a far less positive trajectory. The 8-year-old Afghanistan conflict has long missed its chance to garner public approbation by its brevity. Now, its fate in the annals of public opinion will likely depend on the clarity and success of its ultimate outcome. Gallup polls taken prior to Oct. 22, 2007 may be accessed at Gallup Brain. Later Gallup releases may be found at Gallup.com or GMJ.gallup.com.